As their name suggests, the German Shepherd originated in the country of Germany. They were originally bred to herd animals (thus the name shepherd.) In the 1900’s a gentleman named Max von Stephanitz founded the German Shepherd Dog Society and is credited with creating the breed. It’s funny that there are so many German Shepherds named “Max” since that was the name of the original breeder. After World War I, returning soldiers spoke so highly of this breed that their popularity exploded. However, after World War I due to anti-German sentiment, the UK Kennel Club changed the name of the German Shepherd to Alsatian Wolf Hound, and it wasn’t until the 1970’s that their name was restored to German Shepherd. Known for their keen intelligence, high energy, and loyalty, the German Shepherd is one of the most popular breeds of dog in the world. Despite their fearsome reputation, most owners find they are loyal, docile, obedient and a loving family pet. It is because of their intelligence that German Shepherds are trained for military service, search and rescue, and police dogs. With their family they're easy going; however, when threatened they can be strong and protective, making them excellent watchdogs. 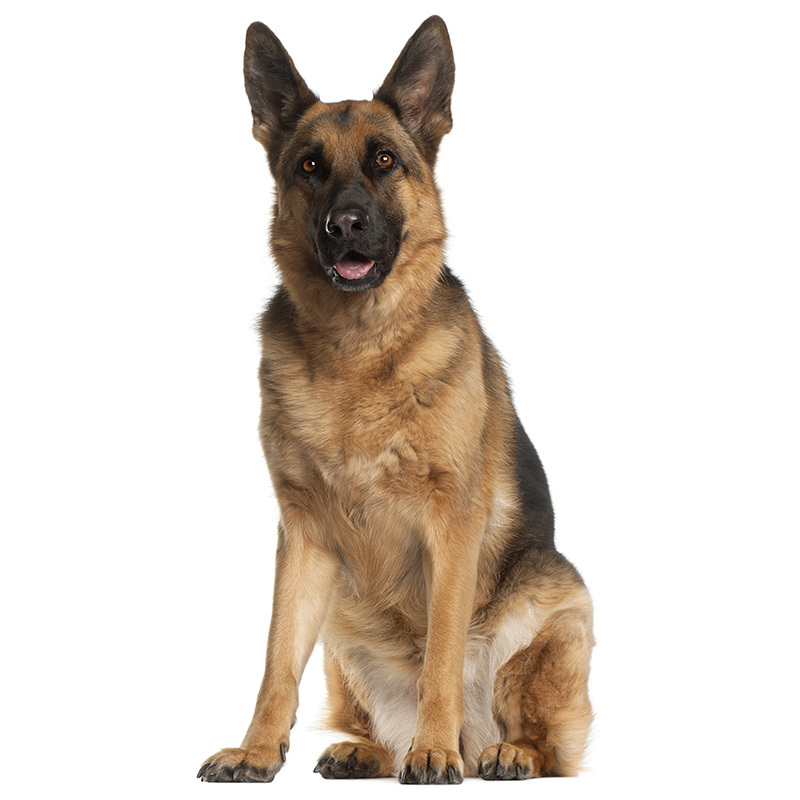 German Shepherds usually weigh between 60 to 85 pounds and stand approximately 23 to 25 inches tall. They have a powerful, well-muscled, wolf-like body. Their coat is dense and medium length, and colors range from black and tan, black and silver, solid black and sable. Brown with black markings is the most common color. German Shepherds are the 23rd most popular breed of dog registered with America's Pet Registry Inc. They are ranked the third most intelligent dog, meaning they understand new commands with fewer than 5 repetitions, and they will obey the first command 95% of the time or better. They were used in World War II to patrol the perimeters of battle zones and also to detect mines. Famous people who have owned German Shepherds are Roy Rogers, Jack Kennedy, and Franklin Roosevelt.